Fourteen countries reportedly recalled their ambassadors to Venezuela after Nicolás Maduro won another six-year term as president. Venezuela's newly re-elected president, Nicolás Maduro, is facing a mounting international rebuke of his victory in Sunday's presidential election. Maduro won a second six-year term as leader of Venezuela with at least 5.8 million votes. That was 67 percent of the vote with 90 percent counted, according to the BBC. The U.S. announced new sanctions against Venezuela on Monday. President Donald Trump said in a statement his administration would prevent Venezuela from selling or collateralizing certain assets. The U.S. was also one of six countries that Reuters reported wouldn't recognize the election results in a joint statement Monday. The other five countries are Argentina, Australia, Canada, Chile and Mexico. Chile had already said it wouldn't recognize the victory, along with Panama and Costa Rica. The BBC says 14 countries recalled their ambassadors to Venezuela. 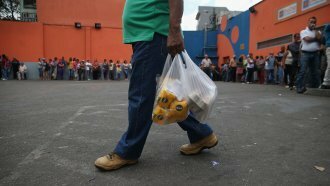 Under Maduro's presidency, Venezuela has spiraled into a crippling economic crisis with sky-high inflation. Voter turnout for Sunday's election was reportedly almost 34 percent lower than the last time Venezuela voted for president.